awfully big reviews: The Lion of Sole Bay by Julia Jones. Reviewed by Dennis Hamley. 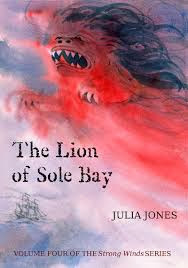 The Lion of Sole Bay by Julia Jones. Reviewed by Dennis Hamley. The Lion of Sole Bay is most suited for the 11 -16 age group. Its plot is sophisticated and the language level is fairly high. The prose is lucid and concrete but makes few concessions to less confident readers. Julia Jones's Strong Winds trilogy, with its acknowledged debt to and echoes of Arthur Ransome translates into a tale set in a relentlessly and realistically troubled modern world. The trilogy stands as a remarkable achievement and a speaking example of how the world of independent publishing is becoming as potent a force as the now ailing image of traditional commercial publishing. Is The Lion of Sole Bay a continuation of the Strong Winds trilogy? I don’t think so. Luke, the main character, was a minor player in those stories and the new main characters only inhabit this imaginative world, although their issues with adults are as urgent and desperate as anything depicted in the earlier books. This novel has a tighter structure altogether than the free-ranging trilogy. The issues raised are subtler and more complex - and more terrifying as well. The characters are drawn with unsentimental accuracy and some ugly depths are plumbed of a sort which never appeared in Strong Winds, outspoken though that was – including the attempted wholesale drugging of everybody coming to a party, which may sound funny but certainly isn’t! This is an ambitious novel in a way different from – and an advance on - its predecessors. Luke is hoping for a week with his father in his boat Lowestoft Lass. He's thwarted by an injury to his father in which the hyperactive Angel is involved in a way which, at first, Luke completely misinterprets, thus setting off the first of many important flashpoints. Meanwhile Helen is desperate to get home to Holland but is trapped on board the Drie Vrouwen with Hendrike, her drug-fuelled mother, and Elsevier, the Kapitein, the fanatical friend who controls her. These two women are dangerous and frightening. The nerve-shredding climax involves all the young people trapped in the out-of-control Drie Vrouwen at the mercy of a wild sea and two seriously disturbed and incompetent adults. What binds all these elements together, besides the waning moon, Hallowe'en and Julia Jones’s understanding and love of boats and the sea? The Lion of the title was once the figurehead of the Stavoreen, a 48-gun ship of the Dutch navy, but now used as a pub sign. It is both a memorial of a seventeenth century naval battle between the English and the Dutch and a potent national symbol which Elsevier believes has to be recovered to further her delusional dreams of power. This is an extraordinary mix which at first sight looks almost impossible to handle as a coherent plot. But Jones succeeds magnificently. The plot lines are sharp; the writing, especially in the tense, dangerous climax, is taut and economical: the tension is almost unbearable. And, not as bits stuck on but essential to the novel's structure, there's even a mad old man in the woods who must be homage to Arthur Ransome's Old Peter, he of the Russian Tales, and a series of lectures on the 1672 Battle of Sole Bay by a character so keen to deliver them that he'll use the garden gnomes as an audience. Terrific book. I loved every word.